Austin Improv • View topic - The Professor's door opens again this Saturday, June 24! 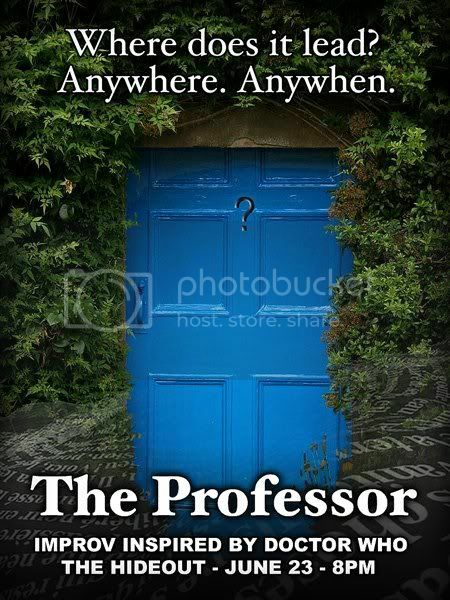 The Professor's door opens again this Saturday, June 24! The Professor returns from across time and space (last night's killer debut show) for another appearance this Saturday at 8 PM at The Hideout! Woo! It's going to be us, You're Not My Real Dad, and Two Shakes of a Bard's Tale. Go buy tickets. Last night's show sold out. What if there was a door that could take you anywhere in time and space? What if there was a man who could show you the universe and save the world with his wits and a smug grin? What if there was a way to do the impossible, learn the unknowable and become the unimaginable? What if...? the fact that Saturday is actually the 25th and the poster says the 23rd should be noted as a result of the time flux variance phenomenon caused by the quantum vector field of the the Professor's TARDIS merging with the Hideout door unit. Meanwhile the thread heading mentions the 24th. So at least there is consistency. The Professor is always right!